Start an ACTION TEAM in your Community! We know you want a more peaceful world. We want to help you make it happen. Be part of a positive, powerful vision for cultural change. Click here to Sign-up to be an Action Team Leader! At a time of great challenge and opportunity around the planet, it’s time for a peacebuilding constituency to build political will that will help take our communities, nation and world to a new level of peace. We are committed to nourishing, expanding, and empowering that constituency. Have you raised your voice for peace, but yearned to be part of a more unified, powerful chorus? 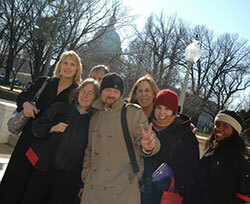 Organize a Peace Alliance or Student Peace Alliance Action Team in your community. Find deep fulfillment and connection with others. 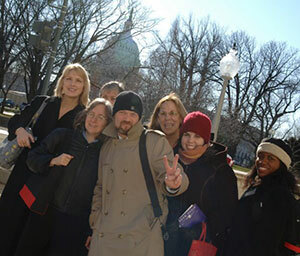 Peace Alliance Action Teams take various forms – they may meet together every month for a powerful national conference call, take our monthly action together, and work with Members of Congress and the media to create new champions for peace. Communities are safe, loving and nurturing for all our kids. We invest in programs that prevent conflict, before it erupts into violence. We smartly intervene when crime or violence does occur, looking to restorative & rehabilitative models. Millions of peacebuilders are at work in conflict hotspots around the world. We empower ourselves and our families with the interpersonal skills to live a more peaceful life. Our policies and laws match our peaceful values. Join us and be the change you want to see in the world. Congress: Use your voice as constituents to educate and inspire your elected officials to champion policies that support the work of peacebuilding. Media: Learn to have Letters to the Editor, Op-Eds, and Editorials published in your papers, get on Talk Radio, and more. Powerful spokesperson: Learn the language of peacebuilding and how to be an effective advocate. Build strong coalitions: Learn to build strong alliances in your community with key stakeholders, practitioners and community leaders in order to manifest a new peace constituency. Build strong teams: Learn to create action plans that will move the levers of power. Have fun and Be the Peace! This activism is positive, empowering, proactive and solution based. We strive to embody the values of the policies and worldview for which we advocate. Sign-up here to be an Action Team Leader! Click here to listen to recent Action Team Monthly Conference Calls with special guests, and to download Monthly Action Sheets. https://peacealliance.org/wp-content/uploads/2013/08/DSC_2615_sm.jpg 256 300 Matthew Matthew2013-09-08 16:32:112017-05-24 17:30:42Start an ACTION TEAM in your Community!